Our family has enjoyed Barber Foods Stuffed Chicken for years. I’ve often purchased the Cordon Bleu, the Broccoli and Cheese, and the Chicken Kiev flavors. These stuffed chicken main dishes are a wonderful way to make a simple yet satisfying meal. 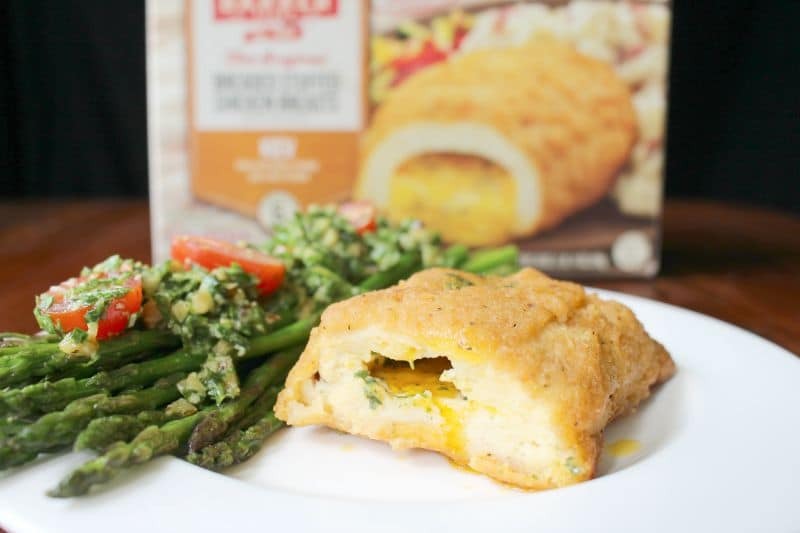 Today, I’m pairing the Barber Foods Stuffed Chicken Kiev with one of my favorite side dishes, sauteed asparagus topped with an arugula pesto filled with parmesan, toasted walnuts, and fresh grape tomatoes. Putting Barber Foods Stuffed Chicken selection next to a flavorful side dish like this one makes even an everyday meal special. I like to serve these for family, because it’s so easy to reach for on a busy weeknight. Since I’ve been buying these for years, I noticed recently that not only has the packaging changed, but the recipe has changed as well. The new box is quite attractive, and the new recipe has a great breading and filling. 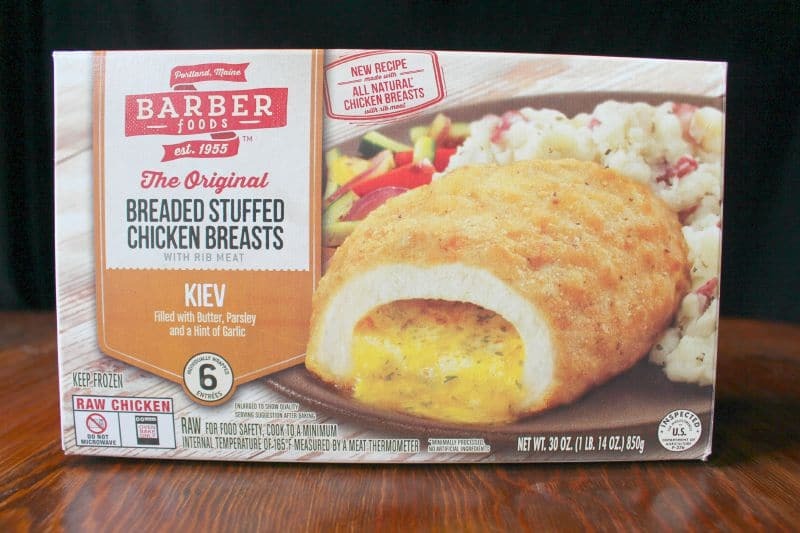 I picked up my box of Barber Foods Breaded Stuffed Chicken Breasts Kiev at Publix, in the frozen foods aisle. 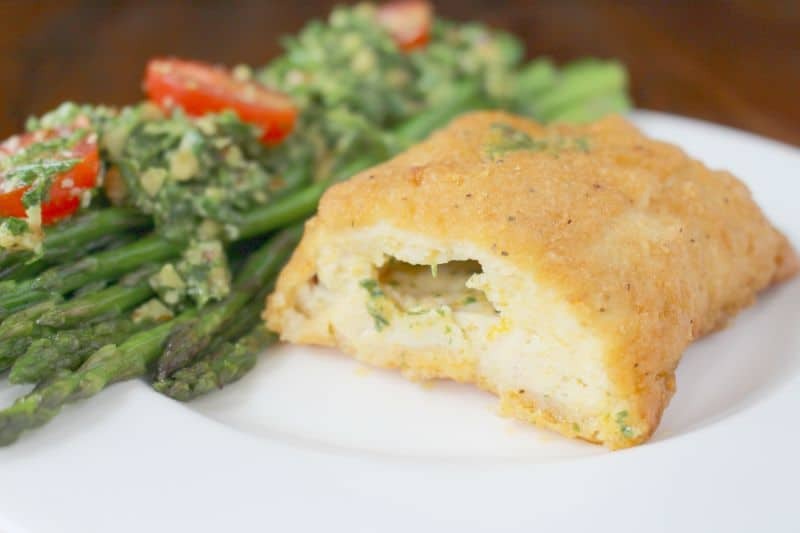 Asparagus is one of my favorite vegetables to prepare, and it pairs beautifully with the savory flavors of Barber Foods Breaded Stuffed Chicken Breasts. The red tomatoes contrast colorfully with the asparagus, and the rich flavor of the pesto harmonizes with the taste of freshly baked chicken. Be sure to visit the website to learn more about all the delicious flavors of Barber Foods. 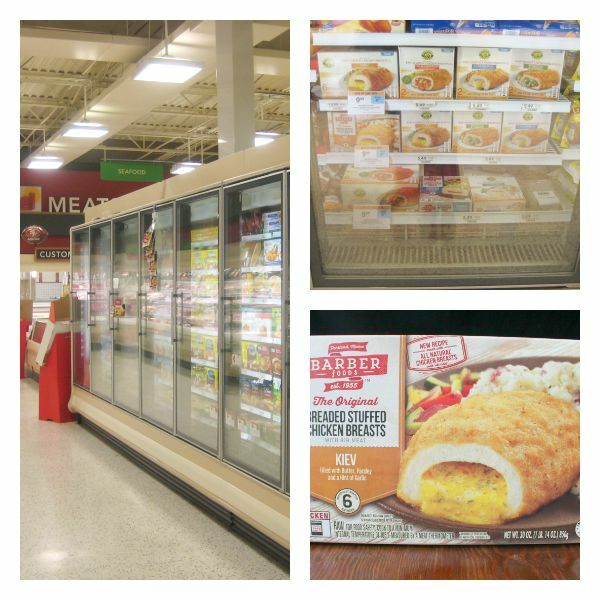 You can also get a coupon for $1 off Original Stuffed Chicken Breasts! Follow Barber Foods on Facebook, Twitter, and Pinterest for even more great dinner ideas. When you cook your Barber Foods chicken, make sure to follow the cooking instructions on the box and cook to an internal temperature of 165 degrees as measured by a meat thermometer. What flavor of Barber Foods Original Stuffed Chicken is your favorite? Finely chopped arugula mixed with chopped toasted walnuts, parmesan, and halved grape tomatoes for a rich and savory pesto, perfect for vegetables and meats. Heat a dry skillet on medium. Add the walnuts and toast lightly for a minute or two, until you can smell a toasty, nutty scent. Set the walnuts aside to cool. Add 1 tablespoon of olive oil to the skillet and heat. Add the asparagus and toss to coat, then sprinkle with salt and pepper. Let cook, stirring occasionally, for about 10 to 15 minutes or until crisp-tender. While the asparagus cooks, chop the arugula very fine. Add it to a mixing bowl. Add the parmesan and a pinch of salt and pepper. Chop the walnuts finely and add to the bowl. Add 2 tablespoons of olive oil and stir until a chunky paste is formed. Toss in the grape tomato halves stir gently to incorporate. When the asparagus is done, top with pesto and serve immediately. I could eat a huge plateful of that asparagus!!! I know I did… right after I took those pictures! 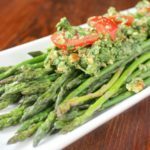 Yum…Asparagus is one of my favorite veggies and pesto on top is absolutely genius! 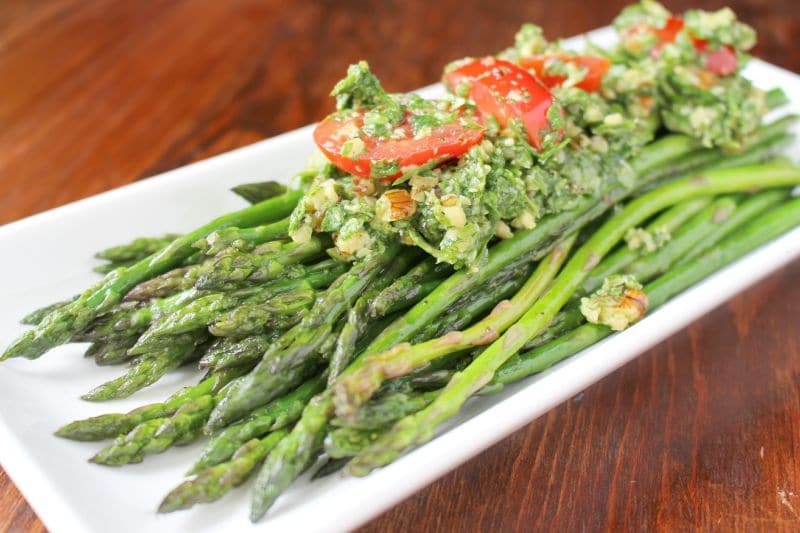 I also like to roast asparagus at 425 for about 15 minutes or so, then top it with this pesto. Roasting is one of my favorite veggie preps. Wow I love your pesto recipe, so flavorful! Thank you! It’s great for using up leftover arugula, too.